George Groves has appointed Shane McGuigan as his new trainer after parting company with Paddy Fitzpatrick. Groves split with Fitzpatrick following defeat in his third world title fight in September, against Badou Jack. McGuigan - son of former world champion Barry - trains IBF super-bantamweight champion Carl Frampton and recently worked with David Haye on his comeback. Groves' first fight with McGuigan will be against 33-year-old Italian Andrea di Luisa in London on 30 January. Di Luisa has won 18 and lost three of his 21 professional bouts, with 14 of his victories coming via knockout. 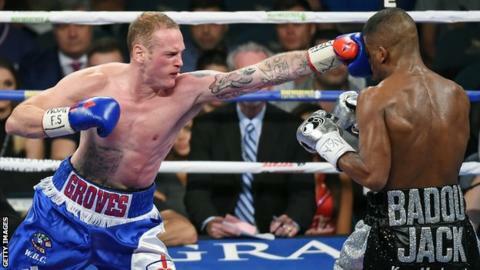 Briton Groves, 27, is rebuilding his career following his defeat by Sweden's WBC super-middleweight champion Jack in Las Vegas - his third loss in his last five fights. Groves was defeated twice by fellow Briton Carl Froch, in 2013 and 2014. He was controversially stopped in the ninth round of his first fight against Froch before being knocked out in front of 80,000 fans at Wembley last summer.